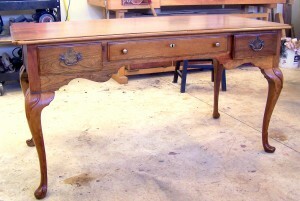 A client called asking that I help in refinishing Queen Anne furniture, specifically a desk they attempted to strip. The piece was a fairly nice, well built Queen Anne desk that was in great shape except for the sanding that the owner attempted to do. When refinishing a piece it is always preferable to remove the top coat (the clear protective layer) in the least intrusive way possible. Since we are a professional shop we use chemicals that flow out of a brush and the piece is in essence washed until the finish is softened and removed. This method removes all the hard protective finish but doesn’t remove all the color and patina. If this is not possible, then a gel stripper would be my next choice. This is much more time consuming but is not abrasive. You brush on the stripper then scrape off with a puddy knife. Then you clean thoroughly with mineral spirits. If this choice is not available, (the stripper won’t dissolve the finish or bad sections require sanding) then you have no choice but to sand it back entirely. When sanding, always use the highest grit possible that still allows proper sanding. (such as 220 grit) The lease amount of abrasive used is the best. 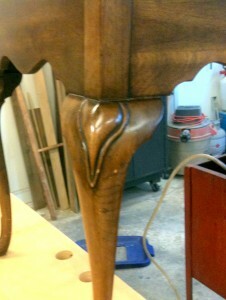 In this case I had no choice but to sand the entire piece because the client had begun that way. After I sanded entirely I cleaned with mineral spirits then applied the color stain I liked. 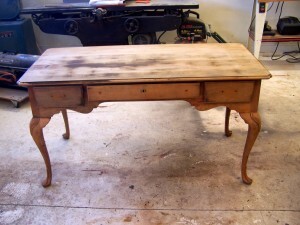 Heres’s what it looked like after the first coat of coloring. I used a standard Burnt Umber – very light coat. Next, I sprayed a seal coat and then brushed on a very light coat of very diluted black glaze. I then “aged” the piece by brushing black glaze in all the crevices and corners.. notice the black highlights on the leg closeup. 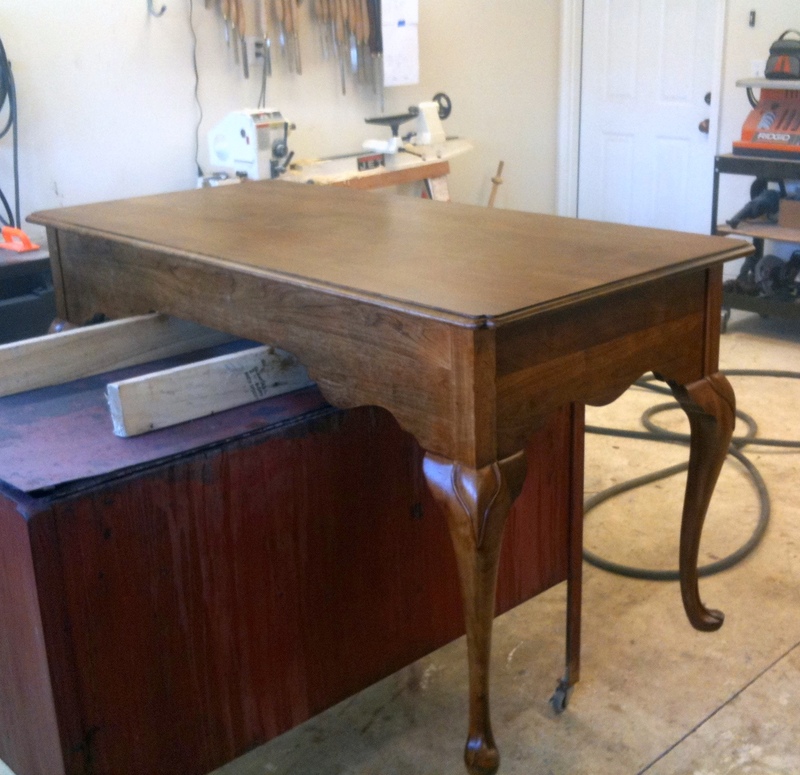 Then I sprayed several coats of the final finish….seems easy doesn’t it? ?